Whether taking a trip cross country or driving to the corner store, Akar Logistics® can help you prepare for the unexpected. Many drivers take their safety and that of their passengers for granted. Akar Logistics® has created an LS Automotive Safety Kit™ for roadside emergencies. 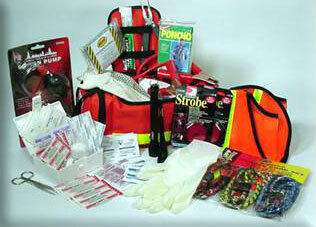 This kit is designed to assist drivers who find themselves needing emergency equipment while out on the road. All of Akar Logistics's products are contained in custom designed, extremely durable cases. These are also screen-printed and labeled, allowing compartmentalization of the products and easy identification and retrieval during an emergency.